Happy, happy Labor Day Weekend to all my U.S. chicas! We plan on going to the Colorado Balloon Classic BalloonGlo either tonight or tomorrow and probably taking the pup to a lake somewhere close. Do you have any big plans? This is a bit late but I wanted to showoff my first Transdesign haul! Of course as soon as China Glaze's Halloween Awakening Collection was available I threw it in my cart and what I wanted of Color Club's Untamed Luxury collection (minus Untamed Luxury and Red Velvet since they were out ~BOO). I haven't tried this yet as I'm still grasping onto summer like a small child latching onto their mother's leg before they get dropped off at daycare. I did get a chance to use the Fast Forward topcoat and am in love! I've been using Seche but I still have some trouble stomaching the warning label that says *cancer. * Fast Forward was quick and smooth like glass so I may be using that from now on. Look at the other yummy-ness! Left to right Color Club Twiggie, Pucci, De-Luxe-Cious, Covered with Diamonds and Orly Winter Wonderland and Space Cadet. I think I may want Orly's Glitz and Glamour for the holidays but not sure. I also think I'll be getting Orly Halley's Comet since I don't already own the other dupes showcased by all you talented comparison bloggers out there. What have you been waiting to get your hands on? this is an awesome haul! I have also had my eye on space cadet but I just think I have enough nail polishes for now? =/ maybe not... Does your doggie go play in the water when you take him to the lake? Mine hates water. wow those look so gorgeous! 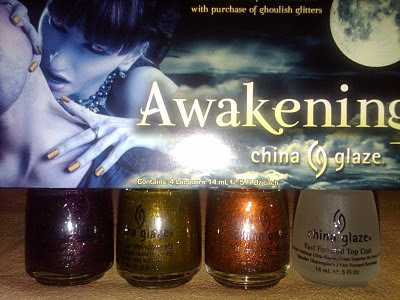 I have never tried any China Glazes, OPI, Color Club or anything :/ How are these nail polishes? Aggie ~ The hauling is getting out of control for sure =/, I'm on a hold until October but that apparently didn't stop me from two scented polishes at Claire's today oops. Yes my boy loves the water and even tries to get in the shower in the morning haha. Katrina ~ It just scares me to read that warning label on anything other than cigs ya know? Have a great holiday! ashhygoesrawr ~ You are SOO missing out! I'm in love with China Glaze, Color Club is a super bang for the buck. I literally own one OPI just because they are less attainable and more expensive. Thanks Lacquer! I wasn't so sure about Zombie Zest but of course I had to have the entire set!!! Freshie have you tried Poshe topcoat. It's free of formaldehyde, toulene and DPH. I have been using it lately and it's awesome (work with konad too...but be extra careful with konad black) I can't use seche often because I'm allergic to toulene. I'm undecided on the Winter Wonderland (got Rockin Rocket and Meet Me Under the Mistletoe); will look forward to your swatches. KarenD - I'm hoping to showcase it soon! Can't wait for yours.